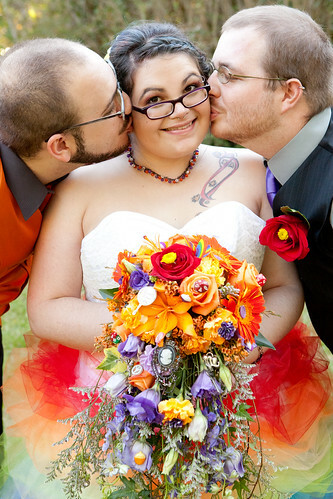 Polyamory in the News: "A poly wedding: My decision to marry my boyfriend while I'm legally married to my husband"
"A poly wedding: My decision to marry my boyfriend while I'm legally married to my husband"
Read the whole article (July 31, 2013). Angi tells us, "Being able to read the personal narratives of others (and share them with my husband) was extremely valuable to me when first embarking on living polyamorously. And being able to offer that kind of insight to other newly-poly or wishing-to-be-poly people is really meaningful to me." She has written a brief piece on her blog about her back-to-back Offbeat Bride and Salon stories. Thank you for sharing this. As the "third" in our family, I often hear myself wishing I could get married. It isn't that there is anything inherently less about my part of the triad relationship. It is just that deep, seemingly immutable wish for the affirmation of the community.